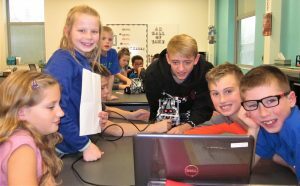 (Uniontown, Ohio) – The Lake Local School district is bringing the learning of basic programming, coding, and robots to students as young as kindergarten. This new vision is taking shape following a mandate the district received from the community to provide 21st-century technology to students when Lake passed its last school bond issue in May of 2015. Now, in Kindergarten and first grade, students are introduced to robot construction kits called Cubelets involving small color-coded magnetic blocks. Officials explain endless, different types of modular robots can be created depending upon how the action, sense and thinking Cubelets are snapped together. “For example, if a student properly puts together a light Cubelet and a batter Cubelet, a light will turn on,” said Pilato. Students in grades second – fourth are learning to code small blue, circular shaped mobile Dash and Dot robots, (when properly coded they can move and speak), as well as use a computer app called Blockly on their iPads. Blockly allows students to create colorful, simple drag-and-drop block coding, as another introduction to computer science. “The Blockly app includes a self-guided tour so students can easily follow directions on how to work with it,” added Mrs. Dills. Students who quickly grasp coding with Dash, Dot and Cubelets can also use challenge cards to help them expand their learning. 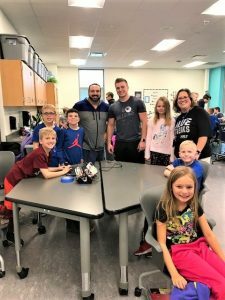 This year, a third-grade five-week Robotics Boot Camp program has also been conducted in Cindy Mullen and Jennifer Carey’s classes, with hands-on support from 10 high school GenYes students. The boot camp started in early November. 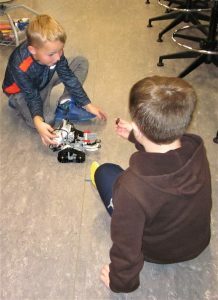 Ten Lego Mindstorms EV3 robot kids are being used and allow third graders to quickly build, program, and command their own LEGO robots. Robots can be programmed and commanded to drive, shoot, slither, walk, slam, spin and much more; a EV3 Programmer App can be downloaded to their laptop computers allowing students to bring their robot to life. Boot camp guest and volunteer Brian Neiss, a Lockheed Martin mechanical engineer and parent of Mrs. Mullen’s third-grade student Hunter Neiss, has also been talking to the students about careers in engineering and robotics, work done by different types of engineers, and engineering completed by his employer. Meanwhile, in grades 5-6, students in Mallory Wickham and Kathy Tobin’s classes are now using Lego Wedo 2.0 “Milo the Science Rover” robots to complement their earth science unit about territories; they are also using documentation tools to complete a writing unit. And in Yvette Anderson and Jan Roberto’s classes, students are using the ‘Spy Robot’ to learn how to code a sensor and record their own voices. All fifth and sixth-grade students will be participating in these hands-on building and coding activities. “In every class in every grade, kids work in groups, promoting communication, collaboration, and cooperation,” said Mrs. Dills. At the middle school, students are being introduced to developing mobile apps using MAD-learn software. It allows students to plan, design, and create a computer app to present information in a high tech way with a home page, buttons, etc., vs. creating more traditional written reports or Google/PowerPoint slides. “This continues students’ exposure to programming and coding. At Lake Middle High School, students don’t use posters- they are using technical skills to show off,” said Pilato. Finally, starting as sophomores in high school, Pilato’s GenYes students are developing and using high-level computer skills to troubleshoot problems with software and hardware, assist staff and fellow students with technical issues, create videos and other presentations, and complete other computer-related, technical projects as assigned. Within the past few years, several of Lake’s GenYes students have earned prestigious GenYes certification after successfully completing a rigorous list of IT tasks including technology integration and break-fix computer issues, and after interviewing with a panel of GenYes employees. 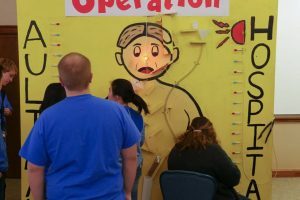 “The big picture is that students who will be entering Lake Middle Lake High School in the years to come will have a completely different skill set than what we’re dealing with now. Kids will learn at an earlier age that they want to go into computer science related fields,” said Pilato. “We will not be able to keep up with these kids when they reach high school. The skills they will have will be incredible,” added Assistant Superintendent/Director of Technology Pat Carroll.